Data science is itself a strong tool for data scientists, data analysts, and business intelligence, then what is the need of adding Python with it? Answer is so simple, to accelerate the work or in simple word if we say, to improve the quality, and quantity of task without consuming more time. 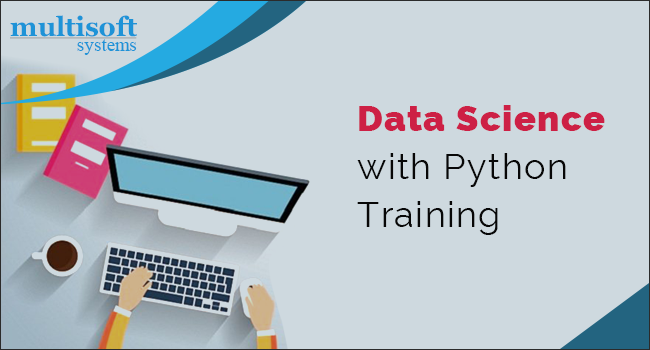 Their primary attention of the trainee of Data science with python is on learning the use of the tool perfectly. The beginning of this course is python programming environment, downloading, installation, programming techniques, and how to take a help for any python query. The course also included the data manipulation and cleaning methods using Pandas data science library. Data science or python both are designed to manage and develop the work efficiently. The curriculum of both the courses are designed from starting to end using simple methods of teaching or reading, anyone can complete their course by self-study too, and the most important is no any necessity of any higher qualification to join this course. Anyone from graduate to master degree holder can join this course; candidate may be an employee of any organization. The course is finished at statistics primer, experiencing how multiple statistical measurements can be implemented to DataFrames. At the last but not least, after this course candidates will be able to take, manipulate and clean the tabular data, and run basic analysis. Knowledge about the history of Python and its origin. Most Multisoft systems courses are delivered as private, customized, on-site training at our clients’ locations worldwide for groups of 3 or more attendees and are custom tailored to their specific needs. R vs. Python for Data Science: Who Wins?